Grady-White center consoles are, “Since 1974, built with the most comfort and highest function thanks to continuous innovation. It may be a secret to some, but Grady-White is the leading center console builder in the world today…”, says the 2014 brochure. 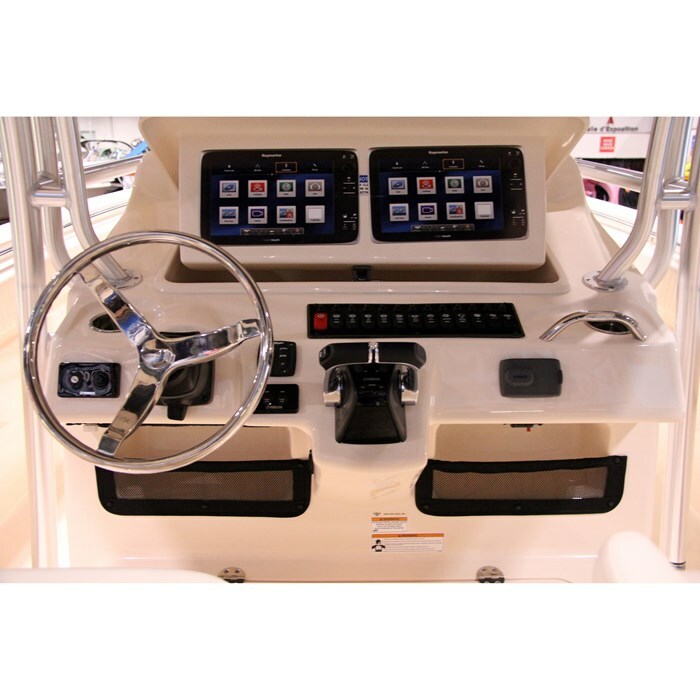 And after forty years in the center console business (fifty-five years in boat building), for 2014, this Greenville, North Carolina builder offers nine center console models from eighteen to thirty-seven feet along with nineteen additional models of Coastal Explorers, Dual Consoles, Express Cabins, and Walkaround Cabin boats. 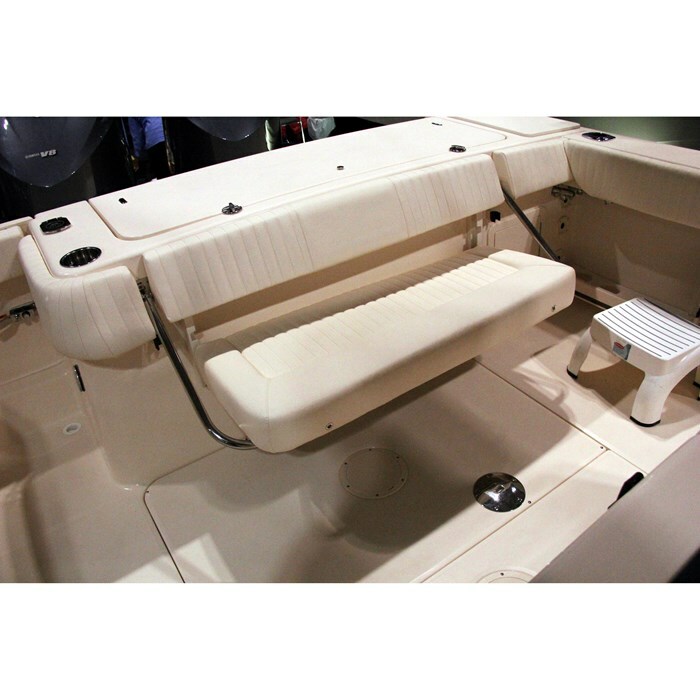 The nine center console models include four Fisherman models from eighteen to twenty-five feet and five Canyon models from twenty-seven to thirty-seven feet of which this Canyon 306 is sized right in the middle. The Canyon 306 is big (30’6” center line length), wide (10’7” beam), and deep (27” cockpit depth) and is rated to handle up to a whopping 700 total horsepower. It weighs in at 6,950 pounds dry without motors and provides 75 square feet of cockpit room. 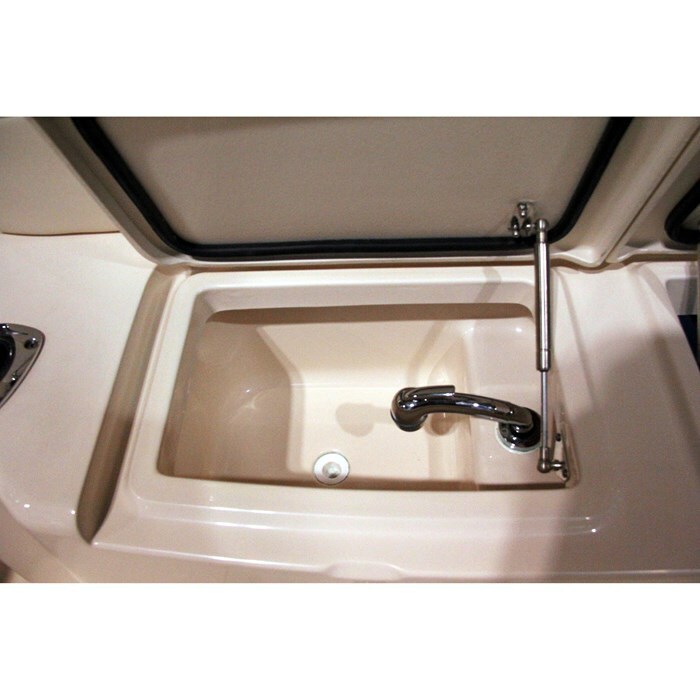 In addition, it has a huge center console with enclosed lockable head compartment featuring stand-up headroom, ventilator, opening screened window, shower, sink, bulk storage drawers, upper level storage, plus a marine head with a hinged cover over it and with holding tank. And that’s just on the inside of the console. On the outside, this console is just as accommodating, feature-packed, and innovative. 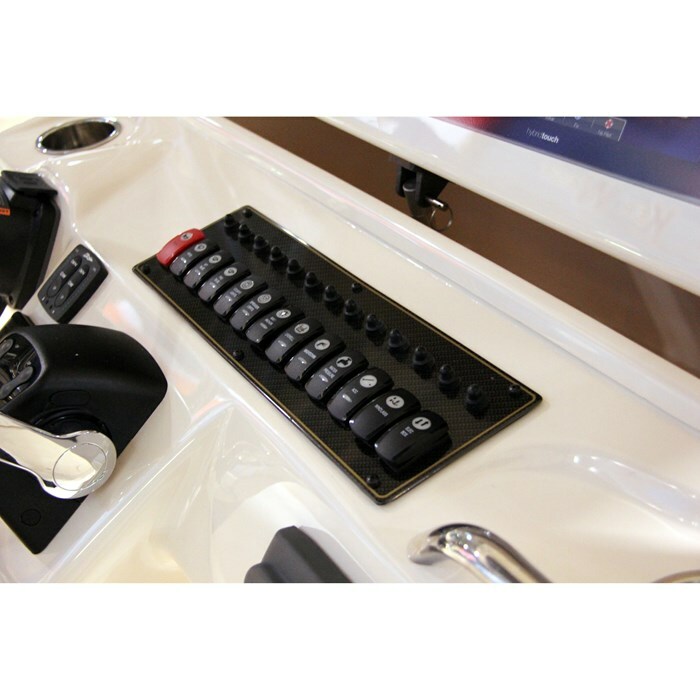 The front of the console is beautifully sculpted yet business-like with center-mounted motor controls, easy accessibility for the driver for DC switches, good visibility for gauges, and a handy stainless steel grab bar for the right hand passenger. But the centerpiece of this console is the full-width electromechanically operated electronics enclosure which hinges up out of the console and capable of housing two large electronic screens. A molded hinged-top footrest doubles as a storage locker. The tempered glass windshield includes a standard wiper with freshwater washer. On the forward side of the console is a molded two-person forward facing seat with cushioned backrest. 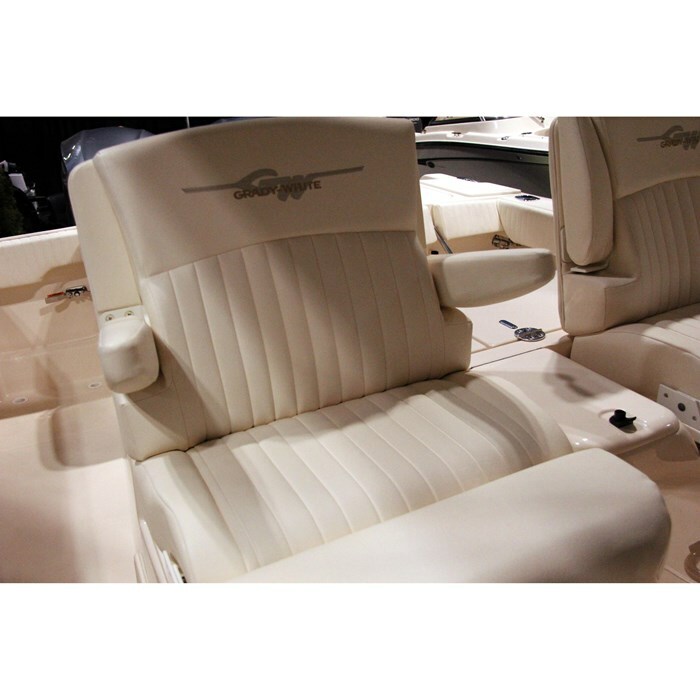 Facing this console are two lean bar mounted Deluxe II adjustable helm chairs with armrests and flip-up bolsters. 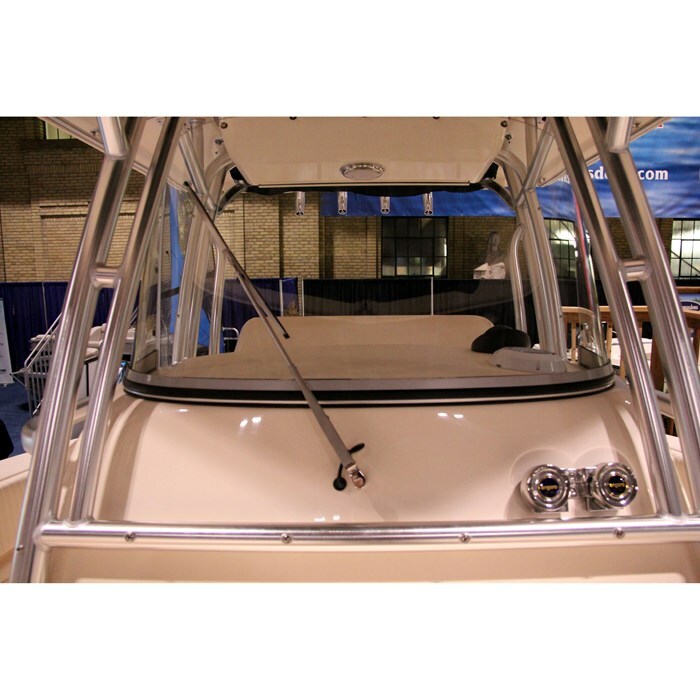 This lean bar includes a rigging station with freshwater sink with pull-out faucet and an insulated bait box. It also includes a 47-gallon, lit, insulated raw water livewell with overboard drain, lockable bulk storage, lockable tackle trays plus two rod holders. There are a total of six rod holders on the Canyon 306 and horizontal lockable rod storage for six rods. In the bow area are two facing port and starboard longitudinal padded bench seats with insulated 150-quart fish boxes and cockpit coaming bolsters. On the foredeck is a huge anchor locker with bow stem thru-hull anchor roller and standard remote controlled anchor windlass. 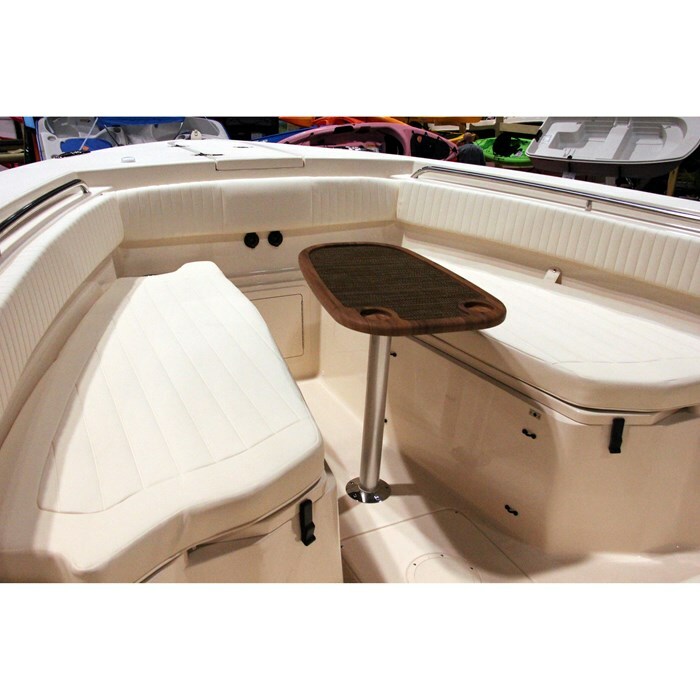 At the transom is a fold-away cushioned bench seat, 304-quart insulated fish box, and fibreglass transom door. Other notable standard equipment includes a 100% hand-laid hull and deck with basic flotation, non-skid fibreglass self-bailing inner liner, cockpit bolsters and toe rails, pop-up cleats, cockpit freshwater shower, freshwater and raw water washdowns, hydraulic trim tabs, and blue LED cockpit lighting. Notable factory options include a fibreglass T-top with radio box, spreader lights, rod holders, outrigger plates, etc., a very upscale stereo system with several accessories, electric head, bow thruster, a convenience package which includes a battery charger and dockside power, a casting platform insert with cushions, and a bow table. 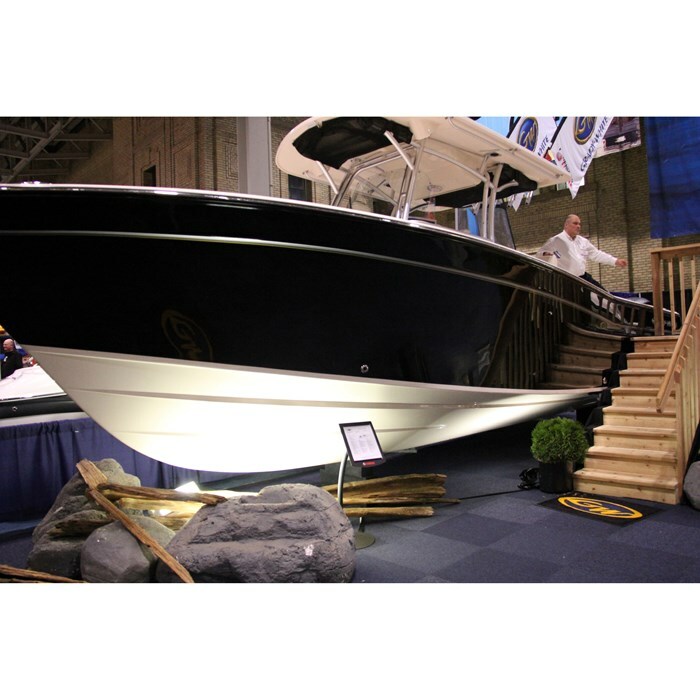 All Grady-White boats, including the Canyon 306, ride on SeaV²® hulls which are designed exclusively for Grady-White by C. Raymond Hunt Associates, “the originators of the modified vee.” The SeaV²® is said to be a “continuously variable vee” that continuously sharpens from the transom to the bow stem to provide a softer ride at sea with stability at rest and when trolling. Check out Grady-White’s website as it is interesting to compare the factory performance results of the three motor packages tested on the Canyon 306: twin Yamaha Four Stroke 250’s, 300’s, and 350’s. Both the 250 & 300’s are the same V6-based blocks; the 350’s are V8 blocks. Note that the tests were not all done on the same day or even the same year, and therefore weather and water conditions (and even Yamaha motor parameters) may not have been comparable, but it is interesting to note that while optimum cruising speed and fuel mileage does not vary too substantially among the three engine choices, top speed does vary quite substantially. All three choices would be excellent so choose the best motor combination for your particular needs.